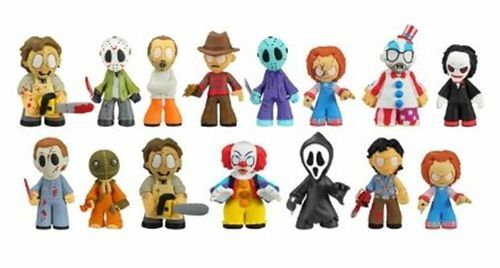 Funko’s awesome new Horror Classics set of Mystery Mini vinyl figures includes Michael Myers, Sam from Trick ‘r Treat, and Captain Spaulding (House of 1000 Corpses), as well as 9 other modern icons. The complete set of 15 new 2.5-inch figures also includes two versions of Leatherface (The Texas Chain Saw Massacre; regular and blood-splattered), two versions of Jason Voorhees (Friday the 13th; regular and glow-in-the-dark), two versions of Chucky (Child’s Play; regular and damaged), Freddy Krueger (A Nightmare on Elm Street), Pennywise (It), Hannibal Lecter (Silence of the Lambs), Ghostface (Scream), Ash (The Evil Dead), and Billy (Saw). The Horror Classics Mystery Minis will be in stores this October.